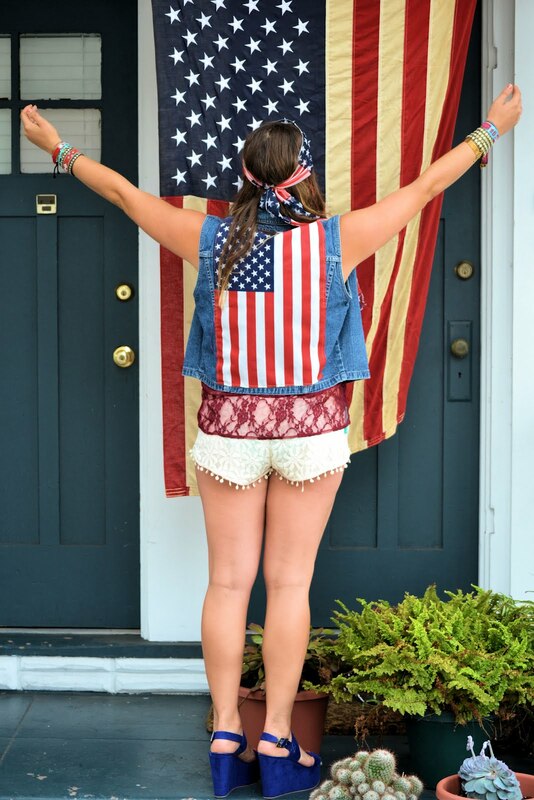 So last year I made my absolute favorite american flag shorts for the 4th of July...which actually helped me to win the PacSun Holy Denim contest last summer! I had been lusting over the American Flag vests that I kept seeing from LF, so literally last minute...I remembered I had a vest I bought from Goodwill for 3$ that I had never used for one of my DIY projects!!! I ran over to Michael's found an american flag...and just sewed the flag straight on the vest! It was the easiest project I have ever done, and I got SOOOoooO many compliments! I also ran into forever 21 and scored these awesome blue platform heels! They paired perfectly with my red, white, and blue outfit! The day was perfect....from my outfit, to spending time with friends, and being in beautiful Coronado! One of the best 4th of July's yet :)!!! I always love going to the fair every year! This shirt totally screams FAIR...so I had to wear it! Enjoyed the day with some friends...ate way to much food...and went on some fun rides!! I <3 the Del Mar Fair.